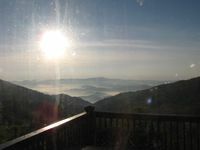 Property 1: Escape to Linville Falls & Jonas Ridge, NC! Property 2: Riverfront Newland Home w/Pool & Golf Club Access! Property 3: Land Harbors Lake Home w/Outdoor Fireplace! Property 4: Ryan's Rest- Comfortable Home, Spectacular Views! Property 5: Completely remodeled! Fenced yard! Close to amenities in Linville Land Harbor. Great Location Lovely Newer House Central AC summer!!!!!!! Property 16: Great Location Lovely Newer House Central AC summer!!!!!!! Property 17: Welcome to A Cut Above where Mountain Living is a way of life and fall is here . Evergreens 521- ENTRY LEVEL,Close to High Country Attractions, Gated Resort w/ Pools, Fitness, Fishing, & more! Property 21: Evergreens 521- ENTRY LEVEL,Close to High Country Attractions, Gated Resort w/ Pools, Fitness, Fishing, & more! Property 23: Creekside Hideaway - 3 Bed/3 Bath Plus Loft! Property 36: Easter Special! Close to waterfalls/trails/lakes. Private Firepit & hot tub. Property 43: NEW LISTING! Secluded Beech Mountain Get-A-Way! Property 45: This Luxury Cabin Certainly Has A Million Dollar View! Log Cabin On 10 Acres! 3 Story Air Conditioned House with a View and Low Rates! Property 46: 3 Story Air Conditioned House with a View and Low Rates! This place is awesome! The view alone makes this place 5 stars. You're at the top of a mountain and have an unobstructed view into the beautiful valley below. Every morning we were amazed by the sunrise over the far mountain. The place itself is very clean and well kept, we used the stove, fire pit, grill, ping pong and both bathrooms are in great shape! It has a very cool feel and plenty of room for 6 grown men to live in for 4 days. The owner is super responsive and was helpful and answered any questions we had. Thanks for the great stay, we look forward to coming back! The house had everything you would need, great for a girls get away or family. 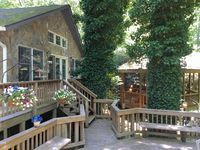 The beds were comfy , everything was neat and in order, with a fully equipped kitchen and large table for dining.The backyard has large trees with a great firepit and a large wrap around deck outside . The hot tub was clean and large enough for a few people, very relaxing after a long hike at Linville Falls. Would go back near Blowing rock and lots of other activities as well. I am ready to go back.